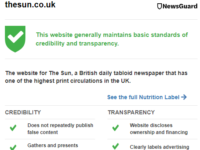 The Mail on Sunday has been censured by press regulator IPSO for the second time in the space of a week for publishing a story which contained inaccuracies. 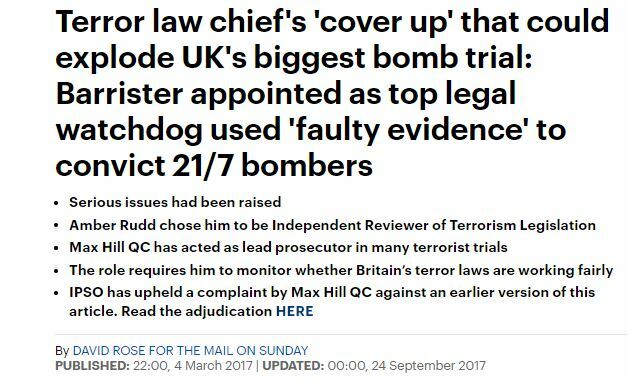 Lawyer Max Hill complained over a piece headlined: “The terror law chief and the ‘cover up’ that explode UK’s biggest bomb trial” which was published on 5 March in print and by Mail Online (pictured). 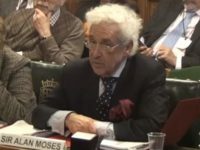 It claimed that Hill, a barrister who has been appointed as the independent reviewer of terrorism laws in the UK, had been “accused of an alleged cover-up of vital evidence that could cause one of Britain’s biggest terrorist cases to collapse – the convictions of four men for the ‘21/7’ attempted London bombings”. The attempted terror attack on 21 July 2015 saw three rucksacks full of explosives taken on to London Underground trains and one taken on to a bus. The bombs failed to explode. The article said Hill had led a successful prosecution of the men which relied on an expert’s evidence that the government’s Forensic Explosives Laboratory (FEL) warned “might be deeply flawed”. It said that Hill failed to make full disclosure about concerns over the evidence at trial and that this formed part of the case for an appeal against convictions by four of the men. 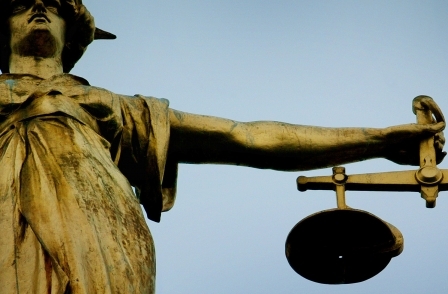 The Mail on Sunday reported that a subsequent Court of Appeal ruling dismissing the appeal of a fifth bomber (who pleaded guilty) stated that the FEL report should have been disclosed, but also said there was no evidence of a deliberate cover-up. Hill said there was no evidence to support the claim that he knew the expert was “discredited” at the time of the trial. He said that concerns over the expert evidence were brought to the attention of the defence counsel and that the expert had answered the questions and responded to the concerns raised. He also said the Mail on Sunday was wrong to claim that it had been prevented from reporting the story earlier due to a “gagging order” on reporting the Court of Appeal judgment. He claimed the title had “rekindled the story” in order to damage his reputation. 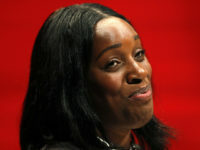 The Mail on Sunday said its article relied on two documents – the notes of the case conference with the expert, and the notes of the prosecution’s visit to the FEL – which were belatedly disclosed during a Court of Appeal hearing, and which the defence were arguing should have been disclosed at the trial. It said the Court of Appeal had issued an order on 10 February 2015 banning the reporting of the appeal while it was ongoing. This “gagging order” was not lifted until the judgment was issued on 30 April 2015. It said that this had been eight days before a general election, which is why nothing had been reported on the case conference until nearly two years later, when Hill’s appointment as the Independent Reviewer of Terrorism Legislation gave the issue a new topicality. IPSO said the Mail on Sunday was wrong to say in a sub-headline that Hill “knew” the expert had been “discredited”. It said this headline was not supported by the text of article so was misleading. IPSO said it was also misleading for the Mail on Sunday to report that the issues the article raised went unreported because the court imposed a gagging order. It noted that the “gagging order” had been lifted 22 months previously. However, IPSO said the reference to a “cover-up” in the headline, and the article’s reference to the complainant being “accused of an alleged cover-up”, were not significantly misleading – given the fact these claims were put in context by the article. The title was ordered to publish the IPSO adjudication on at least page 36 (the original article appeared on pages 36 and 27). 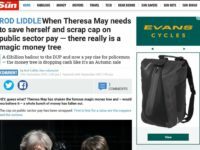 Last week the Mail on Sunday was censured by IPSO over a story which misleadingly stated in a headline that “world leaders were duped over global warming“. 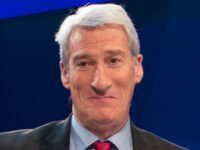 The Mail on Sunday has been found to have breached the Editors’ Code four times this year by IPSO.